Best bling or should that be burned rubber ?! Brilliant race loved the motor circuit course ran in the pits, named the corners, it was an F1 fans dream run. A couple of weeks before the race my coach commented that this race would be “interesting” as the longest road run I have done is 90 minutes and 7 miles on the trails. 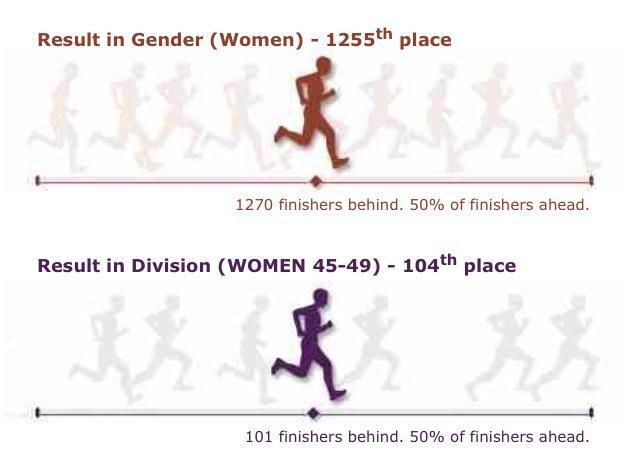 Initially this was going to be the race where I cracked the sub 2 hour mark for a half marathon, the flat fast smooth race track providing the best running surface and oozed PB potential. The Runners World Pacers would be onhand to help. However somewhere along the line of training the focus rightly has been on preparation and base building for ironmanUK so we seemed to have forgotten the PB potential and so far this year I have concentrated on swim efficiency, building the bike miles, core strength, staying safe on the snowboard and my running has been intervals or trail running. 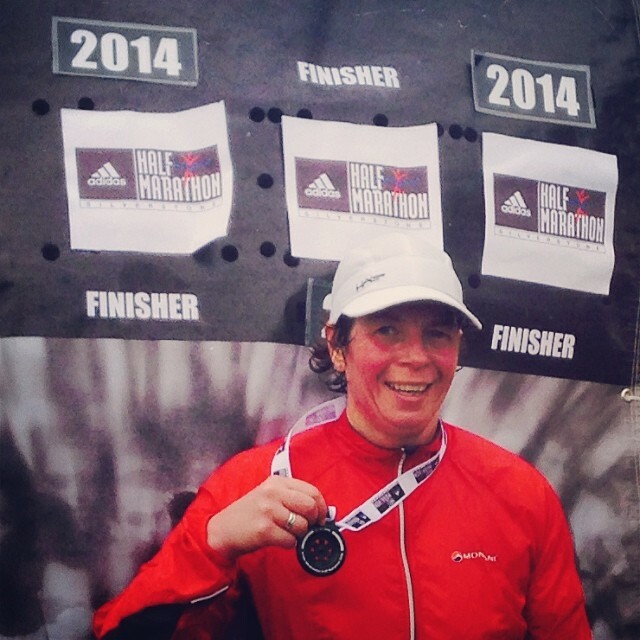 The last time I ran 13.1 miles was on the end of Challenge Henley middle distance 70.3 triathlon. However I went into the race with no regrets and accepted that a PB was not the focus. Instead I approached it as a long run training day with 11,000 others for company and a guided tour of Silverstone circuit with a chance to go through the old and new pit, inner track, service roads and up and down the start/finish straight. Can you guess I’m and F1 fan and just as excited about the location as the run. 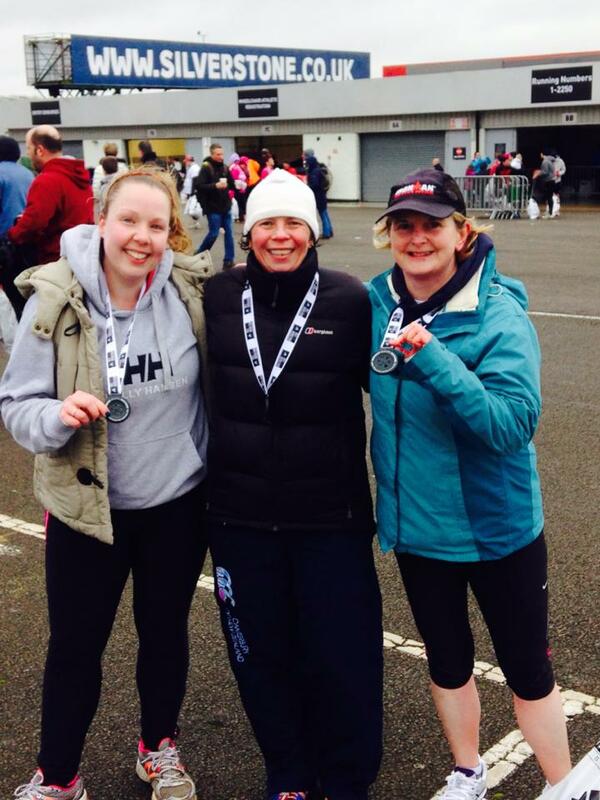 Emma, Vicky and I drove up to Towcester in glorious weather on the Saturday and stayed in a hotel just 2.5miles form the race circuit. We had a relaxing dinner and a few coffees. Reading the race pack we found out that the start wasn’t until midday so we could have driven up on the morning of the race as a friend from Calne did. Never mind it made a weekend of it with friends. A leisurely breakfast at 9am consuming the usual porridge, toast & jam and endless cups of tea in a Little Chef. Looking out the sky was now grey and the flags being shredded on the poles outside. We had ignored the Gale Force weather warning on the app the night before as it was so nice we didn’t believe it or want to believe it ! Getting into Silverstone was a breeze and the marshal know what they are doing with 10,000 of people and cars. There was about a 20 minute walk from the carpark to the race village. The race track is great in catering for visitors needs as there are multiple toilet blocks with proper flush toilets with soft paper not those horible port-a-loos that never have loo rolls in them. Multiple hot food and drink outlets, some part of the circuit then specialised ones such as crepes & ice cream as concession vans. The baggage drops were in doors in the old pit garages so no soggy bags on collection. 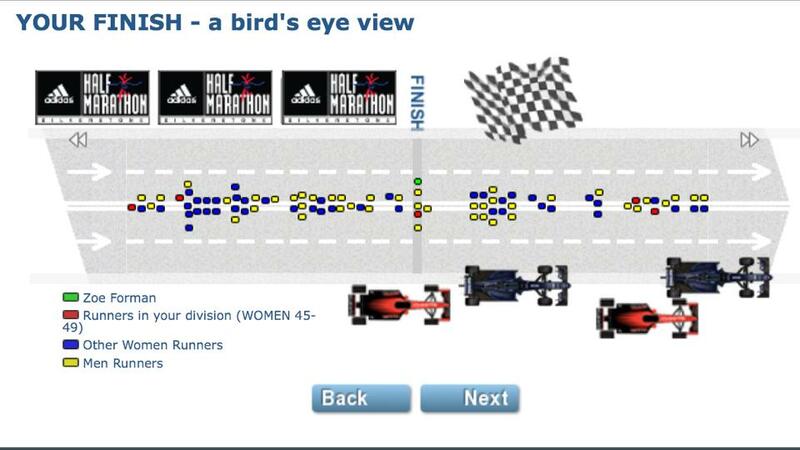 Its a prefect set up for a big race. After joining the loo queues a half dozen times we dropped our bags and headed to the main start/finish straight which was signed less or more than 2 hours. As the track was so wide we could be 40 runners abreast but there was no crowding or jostling just plenty of space. There were no timed pens but the Runners World Pacer flags were clearly blowing indicating where you could go to run with those of similar pace. I sensibly didn’t go for the 1:58 flag but dropped back to the 2:14 pacers flag. This was 10:13 min/mile pace lead by Adrian. We were only on the starting grid for 8 minutes then “The Chain” by Fleetwood Mac blasted out across the circuit, runners bouncing to the beat, heart racing, smile growing and excitement mounting. For those not in the UK this is the theme tune the BBC use for F1 race coverage. Then the air horn screamed and we started a slow forward movement to the start line. Then the a gentle jog and within 3 minutes were were under the start arch and we were off on our first flying lap. Although a dozens steps in I got a discarded black bin liner wrapped around my foot, I tried to step out of it as thought if I stopped I have about 5,000 runners plough into the back of me ! The race distance covered three different laps allowing us on the main race circuit, parts of the old circuit, inners roads, access roads down the pits, through race control and from the starting grid to the ever so familiar finish straight. I settled in with Adrian and his merry gang of followers for the 2:14 pace party. I lost sight of Vic for the first 4 miles but it turns out we were in the same group and met up on a windy section still within the same group. The first few miles there was some cheery chat, then as the wind took our breath away the chatter declined. Adrian’s pace flag was perfect for fine tuning who I would run behind or to the side of so that I had a buffer from the wind. Some times it helps to be short ! Many thanks to the very tall wide man in a bright yellow t-shirt who protected me from some of the worst gusts until he fell off the pace at mile 7. As Silverstone is an old airfield there are no tall buildings, terrain or trees around for miles so its very susceptible to wind and the numerous wind socks around for the helicopters were being ripped off their poles, two were shredded to streamers. It was bloomin windy – gale force 9 level windy ! There were also 3 meter high triangular mile marker boards with digital clocks showing gun time, a third of these had been toppled by the wind, but luckily fell on the grass not the race track. I kept with the pace party and had constant miles all within the 10 minute range. 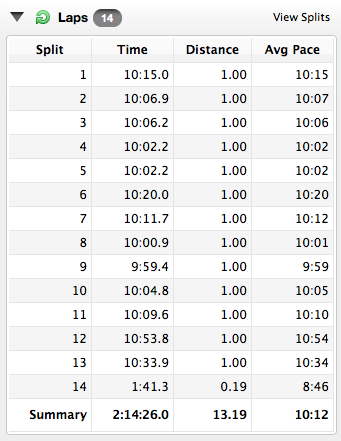 The pace was comfortable even when I was beyond my recent running distance. I took three Torq gels and water on course. Only just before mile 12 on the 2 hour mark did I have a wobble and walked for about 100m as I hit a headwind and hill with no one to shelter from. Then the 12 mile clock board was still standing so I kicked for home, the finish arch in the distance and at last half a mile of a tail wind. Previously when I expected that we would turn and get a tailwind boost there was a building of grandstand blocking the benefit. I was feeling tired in the legs but no specific aches or pains and I’d come through with no injuries. Apart from the gusty games the weather was perfect, and we beat the rain so no wets or intermediates rubber required on track today ! 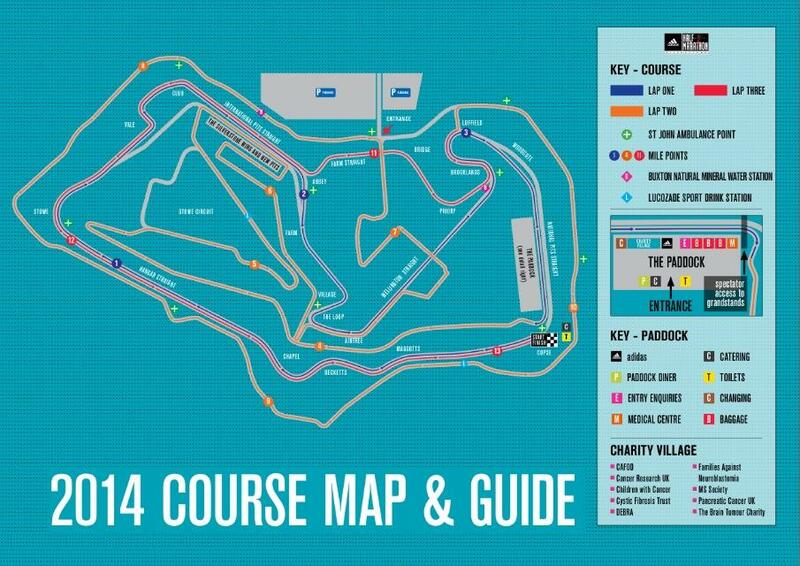 Not just because of the F1 connections but I have to say this is my new favourite half marathon. Slick organisation, good information pre race and signage at race, great post race goodies, unique medal, a t-shirt I can wear as you had a choice of sizes to fit you, a goody bag stuffed with useful recovery food and drink and samples, free parking, great tour of race circuit, only 1 hour 45 minutes drive from home and all for only £18. I’ll be back to run again and maybe get that PB with proper training & hope for a less windy day. 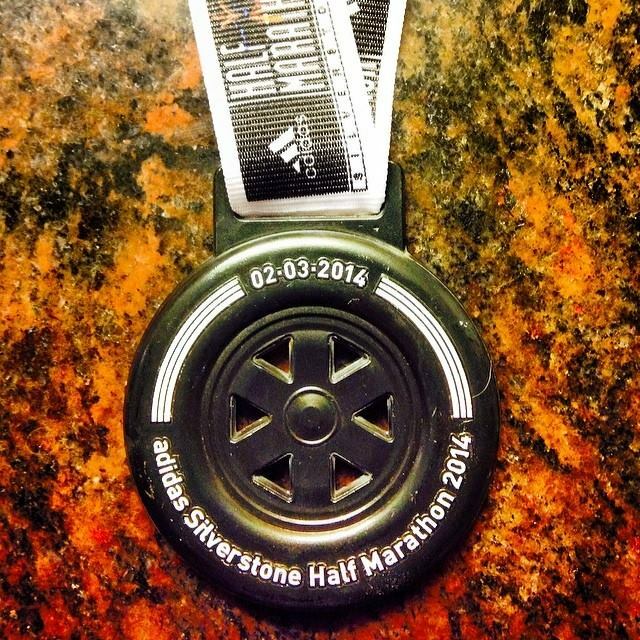 Well done on the half marathon it does sound like your endurance and fitness base is building well, Excellent Race Report and I do like that post race analysis stuff, sounds like an event I will have to add to the schedule for 2015 as it clashed with Reading this year. I’m also doing Ironman UK for 2nd time in 2014 so if you need any tips or info please drop by my blog ewenlewis.wordpress.com or email me, I’m only down the road in Swindon! Cheers ! I normally don’t hit the lake until May but if it warms up have been in for royal wedding in April but just the once. Just reading your progress and impressive journey in pictures. Great story and results.